I am not sure about you, but every so often I come across a song that really resonates with me. It reminds me of something I believe in or have experienced, and I am then touched by it. Songs can hit you and be inspirational, moving and can compel action. I have found that I can remember life’s moments through songs, almost as though the song acts as a mental filing system for me. A song can come on in my car, or at an event, really anywhere — and I can escape right back to the memory, and then revel in those moments. I had the good fortune to see a band I have loved for years (Train) perform in Los Angeles last week. Talk about a band that brings memories fresh to my head when I hear their songs! At the concert they performed a new song of theirs that I had never heard before. It was beautiful and has stayed with me since. I thought it was worthy of sharing on the blog because of its meaning. The name of the song is “Don’t Grow Up So Fast,” and the lead singer of Train wrote the song for his children about the importance of not rushing their experiences by growing up too quickly. For me, I immediately understood the meaning of the words. I could look back to my pre-teen and teen years, and how I wanted to grow up and be to that next phase in my life. I was rushing through moments and not spending enough time reveling in them. Looking back now, I wish I could have embraced them more. Regardless of your age, I think that is a struggle we all have — rushing through life in order to get to the next thing. This song reminds me of the quote “Sometimes you will never know the true value of a moment until it becomes a memory.” With everything that has happened in my life over the past year, I could not think of a more important sentiment to share with each person I come into contact with. Please take these words to heart — and be as present as you can in moments. I hope you’ll take a few minutes to listen to the song (the lyrics are also listed below). 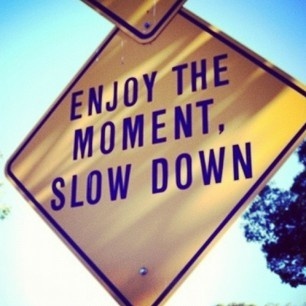 I think we all would benefit from slowing our lives down a bit, enjoying our current moments, and not feeling rushed to be experiencing the next thing. This entry was posted in Character Development, Uncategorized and tagged #bepresent, #dontgrowupsofast, #enjoythemoments, #JLLB, #theconfidencepost, #train. Bookmark the permalink.